Unfortunately, my budget is very tight, so I’m not always able to test the turntables my self. Instead, I read tons of reviews, manufacturer websites, user manuals and specifications. Then, I come up with a list of the best turntables according to the data I have collected. Here is the criteria I used for this purpose. I selected 6 manual turntables. You can check the following table for easy comparison. The Gemini TT-1100USB is a fully manual belt drive turntable. It has a USB port, so you can connect it to your computer. You can digitize your vinyl connection using the Audacity software that comes with this unit. Remember that Audacity can be downloaded for free, the manufacturer didn’t develop the software, it’s an Open Source project. This turntable has RCA outputs. It has a preamp selector, so you can set the output level to LINE or PHONO. The Gemini TT-1100 comes with an S-Shaped tone arm with an universal mount. The counterweight and anti-skate adjustment features lets you calibrate your turntable for maximum performance and sound quality. This product has two play-pause buttons. If you are a DJ, this allows you to position the turntable for scratching or beat-matching. To avoid ground loop humming, this record player has a grounding screw. It includes detachable RCA, ground and USB cables. The standard mount headshell allows you to upgrade the cartridge and stylus. It includes a HD-15 headshell and CN-15 cartridge. The needle matches the Audio Technica ATN3600L. This turntable supports 33&frac13;, 45 and 78 rpm playback speeds and has reverse playback. Remember to buy the right cartridge for playing 78 records as it is not included. The Gemini TT-1100USB has a picth adjust slider. However, it does not have strobe dots. A removable target light can be connected but unfortunately it’s not included. This turntable has decent ratings. Many consumers appreciate the ease of use and setup. However, when I read the manual, I found the setup and calibration instructions incomplete. Not a problem, there are lots of good tutorials about turntable setup on YouTube. Most customers are satisfied by the sound quality produced by this phonograph. Few complaints have been reported. For example, units not working after a year. Very few defective units that were replaced and worked fine after that. 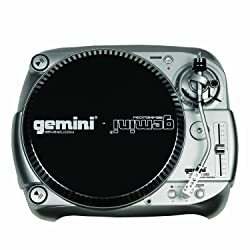 Gemini is a trusted brand that has been around for years making DJ and Pro Audio products. The Numark TTUSB is a belt drive turntable with a USB port for easy digitizing your music with a computer. It is completely manual. It does not even have an auto-stop feature. So if you fall asleep during playback, your turntable won’t stop spinning until you wake up and manually lift the tonearm and return it to its rest. It has counterweight, anti-skate and a pitch control slider, but it does not have strobe dots for visually fine adjusting the speed. Besides the UBS connection, it has hardwired RCA cables that can output PHONO or LINE level signals. It is easy to setup and easy to use. This turntable can play 33&frac13; and 45 rpm records. It has a standard detachable headshell, so upgrading the cartridge is possible. It comes with the GrooveTool magnetic cartridge. The recommended tracking force for this cartridge is 3.5 grams, but it can be adjusted between 3.0 and 5.0 grams. One big drawback of this turntable is the lack of an arm lift lever or cueing lever.You have to be very careful when doping the needle on the record. The workaround is to stop the platter’s rotation by pressing use the start/pause in order to position the tonearm and then press the start button again. The other minor drawback is that it does not have a dust cover. I have read mostly positive comments and ratings and Numark is a reliable brand. Some consumers recommend to replace the cartridge for a better one to improve the sound quality. Some people have reported a humming coming out from the USB connection. This one is a belt drive turntable, excellent for beginner and intermediate DJs. It has a straight tonearm with cardan’s suspension for better tracking during scratching. Easy to use and operate. The tonearm comes with the popular Stanton 500.v3 cartridge pre-mounted on a standard headshell. The Stanton T52B has a counterbalance for adjusting the tracking force. However, it doesn’t have an anti-skate knob or tonearm height adjust. This unit doesn’t have a cueing lever either, so you’ll have to manually lift the tonearm and drop it on the record very carefully. One solution is to stop the turntable, position the needle on the record and then start the turntable to avoid accidental damage. This record player supports 33&frac13; and 45 rpm speeds. It has two start/stop buttons for battle or mix setups. It comes with RCA PHONO level outputs. It doesn’t have a preamp. The Stanton T52B has a manual speed control slider and strobe dots for fine adjusting the rotational speed. As one may expect, this turntable has a grounding screw. This turntable has great ratings and I have not found problems worth mentioning. Stanton is a respectable and trusted brand. This is a great turntable not only for DJs but also for casual listeners. 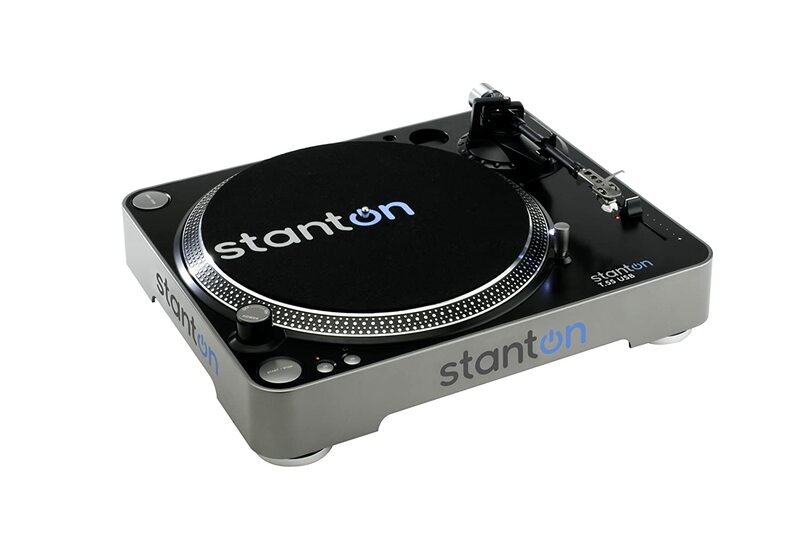 The Stanton T52B is difficult to beat among turntables with similar price. The Stanton T55USB is very similar to the Stanton TT52B. It has the same features and the same cartridge. The difference is the type outputs. The Stanton T55USB has a USB port and RCA outputs with a PHONO/LINE selector switch. You can select the type of output level. With the provided USB cable, you can transfer your music from your vinyl records to your computer and convert them to MP3 or burn a CD. The product description mentions that the products includes Cakewalk pyro Audio Creator LE, a recording and editing software. However, the user manual explains the recording process using Audacity. You can reduce noises by using the Music and Speech Cleaner software also included. If you are not familiar with recording software, expect to spend some time learning the tools. It can be complicated and frustrating for the nontechnical person. This product has very good ratings. Consumers appreciate the solid construction and the great sound quality. I have read some complaints from people wanting an easy solution to transfer their music. For non technical people, this turntable and the recording process may be too complicated. Just keep that in mind. If you are in this situation, you may consider the fully automatic Audio Technica AT-LP60 USB or read my article about digitizing your music without a computer. People find the lack of a cueing lever an important disadvantage. 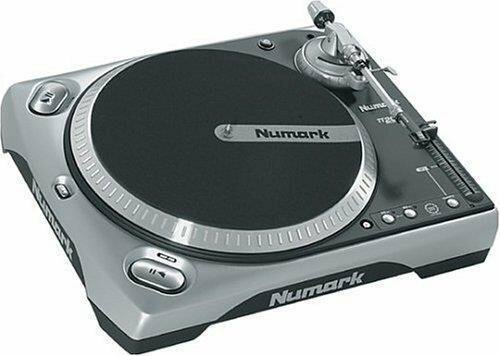 The Numark TT-200 is a high torque direct drive turntable. Perfect for a DJ on a budget. 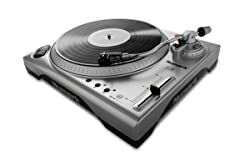 This record player is considered by many a good alternative to the Techniques 1200 at a reasonable price. This turntable supports 33&frac13;, 45 and 78 rpm rotational speeds and has a reverse playback feature. It has a standard layout with two pause/play buttons for either battle or club setup. It comes with a Numark HS1 headshell with a pre-mounted Groove Tool Cartridge and Stylus. It has detachable power and cable connections. This unit doesn’t have a preamp, it has RCA PHONO level outputs. A ground screw is located on the bottom. The TT-200 has counterweight, anti-skate and tonearm height adjustments. A pitch adjust slider is also present, and a quartz button is provided for fast returning to the normal speed. It comes with a cueing lever. Its adjustable rubber dampening feet allows you to compensate for unlaveled surfaces. The Numark TT-200 turntable has good ratings. It’s considered a viable alternative to the Techniques 1200. Numark is a reliable and trusted brand. There are consumers that have had this turntable for over a year without problems. Some of the complains include, units not starting up and speed inaccuracies, but those are really a few. If you have the bad luck of getting a defective unit, contact the retailer and get a replacement. Numark has a good customer service. If you want to enter the world of mix and scratching but you can’t afford a Techniques 1200, this a great choice for you. Few people that tested both, the Numark tt-200 and the Stanton T62, were more satisfied with the Numark tt-200. 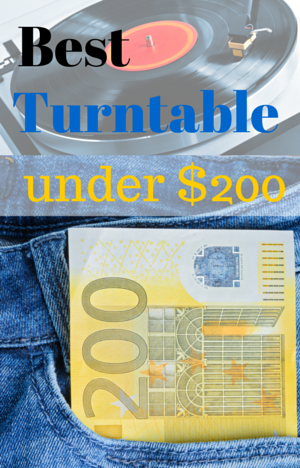 Along with the Numark tt-200, the Stanton T62 is one of the few direct drive turntables under $200. The Stanton T62 has the exact same features as the T52. The only difference is the direct drive high torque motor. This turntable has very high ratings. The bad reviews that I found were issues related to misuse of the product or misinformation. Stanton is a well respected brand and their products are good quality, reliable and durable. All six turntables that have been presented in this article are great products with good ratings. In my opinion the best turntable under 200 is the Neumark TT-200 because of its direct drive high torque motor and all its features. I wish it had strobe dots dough. But this turntable may not be the best one for you, it really depends on your particular needs and budget. The Neumart TT-200 is a great turntable for DJing, but if you need a turntable for casual listening, you may consider one of the other models. Or if you want to convert your music to a digital format, consider the Gemini 1100, Stanton T55USB or the Numart TT-USB.